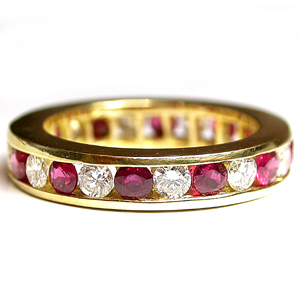 This pretty 18 karat yellow gold, channel style eternity band is set with dazzlng round diamonds and fiery rubies. The diamonds (F/G color, VS clarity) total approximately .90 carat and the hot red rubies are 1.35 carat total weight. The band is 4.4 millimeters all around.